Italy’s new prime minister has big dreams and a small mandate. Matteo Renzi has announced ambitious reforms on a tight deadline. But his position in parliament is weaker than even his sleepy predecessor’s. It is not quite clear just where Renzi stands. His left-centrist coalition cabinet is the youngest ever, yet also strangely conventional, with a technocrat as finance minister and leftist politician for labour minister, rather than the liberal economists some had hoped for. His speech in the Senate, where he narrowly won a confidence vote, offered a curious blend of articulate provocation and bland sound bites. The agenda is ambitious: six months of breakneck reforms, starting with labour markets, accompanied by a small fiscal stimulus. Labour cost cuts, simpler labour regulation and better courts would spur investment, giving Italy’s lethargic economy a boost. If Renzi can show that Italy is doing its homework, he may be able to persuade the European authorities to endorse his mix of less fiscal austerity and more growth. But while dreaming big, Renzi may be missing some simpler wins. For example, he could have done more to deregulate wage bargaining and liberalise services. Also, details are scarce. He has promised a “double-digit” cut in the cost of tax and social-security payments in labour, which at 48 percent is the sixth highest in the OECD group. That could cost the government 30 billion euros. Broadening unemployment benefit could be equally expensive. Tackling Italy’s costly pension system would help, but Renzi steered clear of that in his speech. Can Renzi do it? He has a thin majority, which relies on a small centrist group, and his own party may resist deep cuts in public spending. His willingness to take risks, as evidenced by his recent coup, could help. He may be more willing than previous leaders to use the threat of early resignation to unblock reforms. However, even this threat will be diluted without a new electoral law, also on the immediate agenda. If Renzi can start to make the change he promises, Italian debt and equities will gain sharply. But until the evidence is in, markets should withhold judgment. 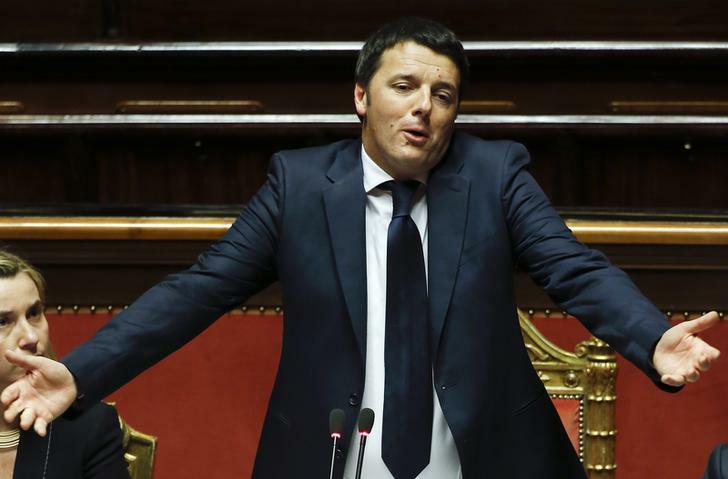 Italy's Prime Minister Matteo Renzi talks during a confidence vote at the Senate in Rome February 24, 2014. Matteo Renzi won a confidence vote in the Italian Senate by 169 votes to 139 on Feb. 24. Renzi’s predecessor Enrico Letta won support from 173 senators in a December vote. Renzi leads a coalition of his own party, the centre-left Partito Democratico, and small centrist party Nuovo Centrodestra.